The Ascension Parish Chemical Industry's CAER Committee has installed a 26-siren community alerting system, designed t be heard within an approximate radius of 2.5 miles of each plant, in an area which the plants are located. The system will provide effective early warning for the community. If there is a chemical emergency that could pose a threat to people who are near the chemical plants, the sirens will be activated, emitting a loud, pulsing signal only in areas where immediate action is necessary. The Wally Wise Guy education program funded by Ascension Parish CAER Committee targets school children in grades PK - 2nd grade in Ascension Parish. 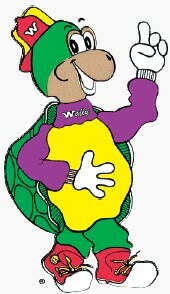 In addition to having a visit from Wally, children in Wally's program receive gifts which highlight his message. But more importantly, the children learn how to protect themselves in the event of an emergency. With his green face, yellow belly, red and yellow baseball cap, purple shirt, red tennis shoes and ready smile, Wally wins the hearts of his audience, the young and young at heart. And because each audience is unique, Wally's message was developed to be understood and enjoyed by all. Who knows better than a turtle that going into your shell is often the best first response for an emergency? That's why he teaches children about "Shelter in Place".